That would have been fair, but you have to knock off $2000 for each scratch on the stickers. 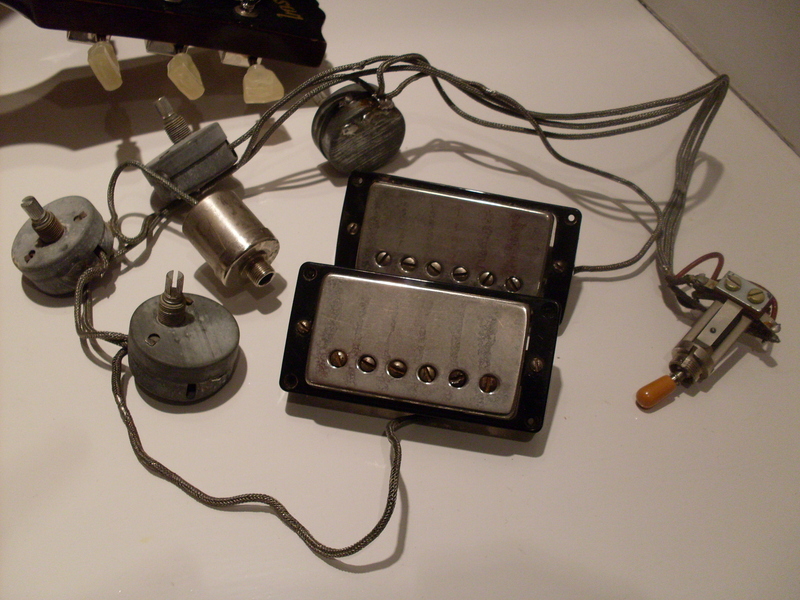 ES-175s and ES-125s have a long history of being gutted for the pickups and harnesses. I like the new plan to tear apart 335s to get the unsoldered pickups out. I smell a new cottage industry. Maybe I’m stupid but how would one know whether these are black, zebra or double white PAFs without unsoldering the covers? And would they be worth more than $15K if the covers were gold? If double whites are worth twice as much as double blacks, maybe these are a bargain at half price if they are white. Get out your routers, a $15000 harness is nothing to sneeze at. An extra rout (or is it route?) 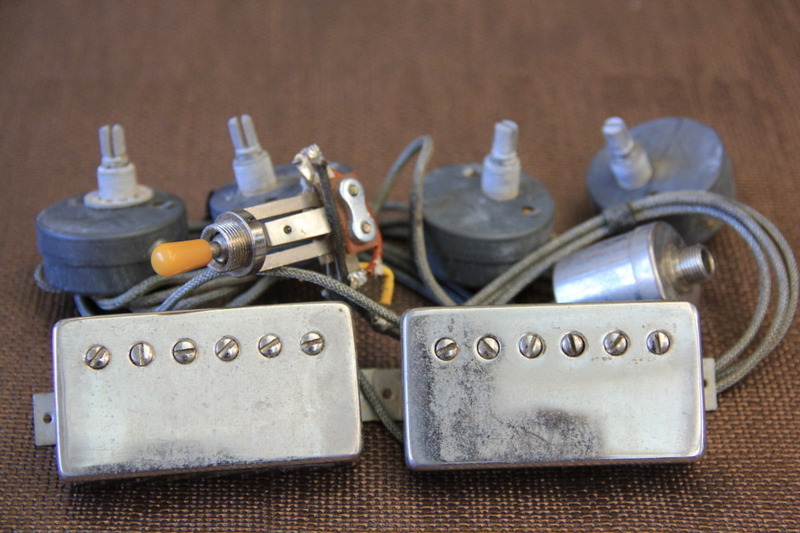 in the neck pickup cavity is the new “Bigsby beard”. Hey Rob not stupid-just need to know the trick…Two things you can do. First, if the pickups are still in the guitar, unscrew one of the pole piece screws and take a look. If its white plastic you see then its either a reverse zebra or, more likely, a double white (most zebras have a white slug coil and a black polepiece coil). If it turns out to be black, there’s still a chance of it being a zebra, so then pull the pickup out and unscrew one of the philips screws on the back under the slug coil. Shine a flashlight in there and if you see white, then it’s a zebra (unless the screw coil was white, then its a DW). If you already have the pickup out, then you can check both bobbins through the back. If they were double whites, then the price is just overly aggressive and not an insult. A sealed pair of whites and a harness could go for over $10K easily. Gold covers are generally worth less than nickel. Unopened white PAFs have gotten pretty scarce, so either is worth some serious coinage. AMEN Charlie! Great post and thanks for hitting the nail on the head about neurotic obsession on complete originality. Little things like original truss rod covers, pick guard screws, strap buttons and other minutiae have absolutely no bearing on the functionality, playability, or tone of the instrument, but are always “nit picking” points for some. I appreciate the collector/purist point of view of having a totally factory “original” instrument, but as soon as you change the factory installed strings, it’s not “original” any more, is it? That’s one of the points I always make to nutty buyers. There are “expendables” and there are “non-expendables”. Anything that can wear out under normal use and is replaceable without breaking a solder or glue joint is “expendable”. I just had a mint 58 (lefty!) with a collapsed ABR1. Does the fact that it will be replaced with a vintage correct one really make a particle of difference? Or would you (or the buyer) rather play it with a sagging bridge. Tuner buttons? Who cares-knock off a buck. It’s always nice when the worn out or broken original parts are included but really, who wants a bunch of rusty old strings (or frets) or crystallized tuner tips? Speaking of original strings, George Gruhn has a 1940 Stromberg Master 400 for sale. One of those huge hunking 19″ acoustics that were de rigeur for big band rhythm comping. This one was used by Freddie Green and still has its strings from when Freddie hung it up for good. Since he died in 1987, those are some aged strings and may add to the value. Asking price? $90,000.